Meet Dr. Mike Woods, a caring optometrist at our Yorkview clinic North York, Ontario. What he brings to the FYidoctors team is not only an incredible amount of education and experience, but also a phenomenal amount of compassion and empathy. Read on for his insights on what drives his passion in and outside of the clinic. I graduated with honours from the University of Waterloo's optometry program in 2013. I completed both my Bachelor of Medical Science (Honours) and my Master of Clinical Anatomy degrees at the University of Western Ontario. My externship in Washington, D.C., allowed me to work in conjunction with an ophthalmologist concentrating on treating cataracts, glaucoma, diabetes, and the anterior surface of the eye. Currently, I am the lead OD at the North York FYidoctors clinic. We have a very intimate and friendly space in a medical building, which allows us to really get to know people who come in. Our small size is deceptive, because our dispensary is elegant and up-to-date. Patients are always surprised that there is such a great retail space in a medical building. Additionally, the other medical professionals as well as a lot of patients frequently come in just to say hello; it's like the Cheers of FYidoctors—where everybody knows your name! My brother was diagnosed with a rare disease by his optometrist; I would not be exaggerating to say that my brother's life was saved because of an optometrist. This led me to shadowing in London, Ontario where I learned that I truly loved the profession, especially once realizing how much difference optometrists make in the healthcare industry. I continue to learn every day from my colleagues and patients in the clinic. I feel incredibly grateful to do what I love. I love interacting with all patients and helping people see better. One of the highlights of my work is when a patient is happy with their glasses because it reflects not only my contribution as an optometrist, but also the sensational work of our dedicated and caring staff. When our guests are happy and enjoying their experiences here, the sound of their laughter is music to my ears. One of my favourite moments working at this clinic is the first time that one of our young kids saw our treasure chest. He was not happy about needing glasses, but when he came to pick them up, I saw him look wide-eyed around the room. Then, I brought out our treasure chest. His eyes lit up immediately and he really couldn't decide which toy to pick. I think the most challenging part of the job for me has to be listening to patients who have lost some of their vision due to ocular diseases. It is so hard for me to have to tell them that their issue cannot be fixed with eye glasses. When we have the discussion that glasses won't work, I can see the disappointment in their eyes when they realize that there is nothing that can be done to improve their quality of life. I am thankful that we have resources like low vision clinics that can help them to adapt to these changes successfully. Come for eye exams! Just because you think you are seeing okay doesn't mean you can't be seeing even better or that your eyes are healthy. Early signs of many eye diseases have no symptoms, but the earlier we can diagnose these diseases, the better we can treat them. I think that the experience will be a more customized one, with advanced technology for both the health aspect of the industry as well as the fashion component where patient choice will be unlimited. My personal eyewear style is fun and funky with a contemporary edge. 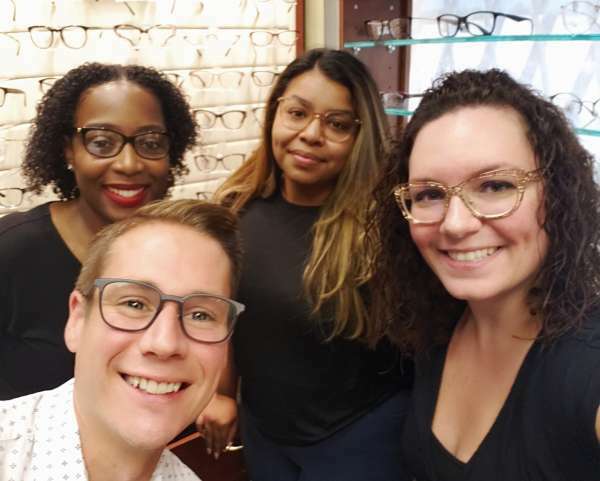 I have extremely high standards when it comes to choosing frames, so I always welcome second opinions from the amazing staff here in North York. They really know how to choose pieces that are perfect for the patient, even if that's me. I absolutely love traveling. I will go anywhere I haven't been before. In the summer, you'll find me somewhere around the beautiful city of Toronto on a patio or cutting a rug on the nearest dancefloor. In the winter, I relax at home completing the entirety of Netflix. Visit Dr. Mike Woods at FYidoctors at our Yorkview Eyecare location.